I was listening to Jill Schlesinger this morning on my way to the office. She is on WBAL every Friday morning with some sound financial observations and advice. The topic this morning was jobs outlook for current college graduates. Jill said the job market is very good. A college graduate this year can expect to land a job making a $50,000 annual salary. She said that is a very good salary for someone just out of college entering the market. Jill also said that the average debt from college expenses is $37,000.00. She believes that a graduate with a $50k job will be able to handle that debt. Well, this got me to thinking about the trades (electrical, carpentry, HVAC, plumbing, etc…) in general and my trade, plumbing, in particular. And I’m thinking that it is good to be a plumber. After finishing four years of Plumbing College at Apple Plumbing and successfully passing the State Journeyman Test, he/she will be earning anywhere from $50,000 -$80,000 annually . During his/her four years of Plumbing College an apprentice will have earned approximately $104,000 in pay. Wait a minute! We are paying someone to go to our Plumbing College? They aren’t accumulating college debt? WOW! Not bad at all for someone fresh out of college. Yes, IT’S GOOD TO BE A PLUMBER! Westminster, Maryland. June 12, 2014. 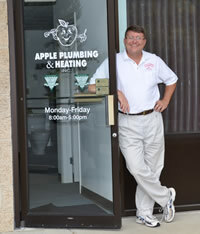 Apple Plumbing & Heating Inc., a full service plumbing company located in Westminster, Maryland recently added two plumbers to the Apple Plumbing Team. Apple Plumbing welcomes Master Plumber Jeremy Mason of Mount Airy with 19 years plumbing experience and Journeyman Plumber Bruce Edwards of Finksburg with 20 years plumbing experience. Apple Plumbing provides general plumbing, well pump, water treatment, drain cleaning, and water heater services to Carroll, Frederick, Baltimore, and Howard County residents and contractors. The company was founded in 1994 by Pat and Sue Scheper both with strong ties to the community and a keen sense for customer service. The business grew by word-of-mouth and by 2009, son Ben Scheper came on board and the company soon moved to their current location on Aileron Court in Westminster, Maryland. Since then, the company has expanded its shop space and now has a full team of seven plumbers and apprentices, three office personnel, five trucks, and one Goldendoodle named Bunker.